By incorporating AR and other new technologies into their shopping experience, retailers can keep up with their online competition. Physical stores are not going away. However, to keep them open and thriving, retailers will need to re-imagine the brick-and-mortar shopping experience. Enterprising retailers and eCommerce players are trialling new store models that streamline and digitalize traditional shopping activities in brick-and-mortar outlets to put the customer firmly in control. There’s every reason for these retailers to not just continue investing in their brick-and-mortar stores, but also to look at new experiences that they can offer customers. A recent Scandit survey of UK consumers found that almost three-quarters (73.6%) felt positive or very positive about traditional physical retailers. What’s more, consumers seem to be in favour of the blended digital and physical shopping experience, as well. When asked about the various apps that they could use in-store, 57% of UK consumers are already using, plan to use, or would use coupons if offered, and almost half (48%) said the same about self-checkout apps. Catering to the value that customers still place on visiting a physical store, there have been an increasing number of well-known pure-play operations announcing that they are breaking out of the Net to open outlets that bring together physical and digital experiences. Global luxury eCommerce company Matchesfashion now operates four London stores as well as its successful online operation; and Misguided, the affordable fashion online retailer which first made its foray into the physical with a concession store in Selfridges in Manchester, has since followed this with further concessions, a standalone shop and an experiential store at the Bluewater Shopping Centre. Catering to a different market, hardware retailer Screwfix combines an online, physical and mobile approach, and has had success using mobile to drive its click and collect service. 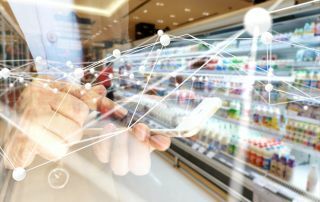 In these, and other cases, retailers are looking to introduce the digital experience into their shops using innovative technology. And this is where next-generation mobile computer vision technology has a big part to play, giving physical retailers an affordable and easily deployable platform to support their evolution to offering a digitally integrated “Store of the Future”. This means innovatively developing solutions and processes that blend the digital and physical shopping experience in a way that boosts customer satisfaction and loyalty, while also streamlining operations and reducing costs. Smart deployment of mobile computer vision and augmented reality (AR) technology into retailers’ consumer and employee apps can turn a typical physical store environment into a connected hub of seamless retailing for employees and customers alike. The ubiquity of smartphones has created a lifestyle where shoppers navigate the “real” world with a constant stream of virtual information and feedback. Brick-and-mortar retailers need to adapt their stores to this new consumer paradigm. By offering smart device-based mobile shopping apps that incorporate mobile computer vision and AR technology solutions, physical retailers can create a memorable omnichannel store environment that can compete with the strongest online players. Customers can point their smartphone camera at a variety of items on the shelf and seamlessly interact with all products in the viewfinder, using mobile barcode scanning and/or object recognition. This digitally enhanced interaction with the physical store environment provides customers with at-a-glance access to product content information and availability, personalised promotions, and other useful content. Retailers can also offer their customers personalised coupons and instant mobile self-checkout, eliminating the need to wait in lengthy queues. Allowing the recognition of multiple objects at once with a single scan and then overlaying a continuous stream of real-time AR information further expands the seamless customer experience. AR overlays digital content into the “real-world” view of a shopper’s smart device screen. So, rather than simply displaying a physical tag listing a product’s social media rating, a retailer could let a customer scan a barcode and pull up a live AR feed of online commentary and reviews. For example, when browsing a book or a wine shop, customers can instantly access product ratings, which makes the selection decision a lot easier and more fun. Or shoppers can scan a whole shelf and identify items of interest, then focus in on individual products for specific details such as ingredients, colour and size. By basing their “Store of the Future” efforts on mobile computer vision-enabled barcode scanning, retailers add new value to an established asset. The retail ecosystem is already built around the barcode as the primary source of product information. By using smart devices and affordable software, retailers can turn barcodes into a seamless customer experience foundation with minimal overhead, particularly by comparison with RFID. Mobile barcode scanning also helps retailers to support and empower their own sales staff from providing them with data on stock levels and availability and item location through to the ability to carry out clienteling services such as arranging deliveries and performing price verifications for customers. They can also more easily help customers to locate desired items, and they have the ability to use multiscan and AR capabilities to scan entire shelves or racks of items instead of each item individually, so saving valuable time. Of course, for retailers, what happens in the back office is just as important as what happens front of house. Here again mobile computer vision and augmented reality can be leveraged to create a solid foundation in support of the interaction between the two. This includes accurate capture of inventory levels of entire shelves, racks, crates or pallets with a single scan. Retailers can also scan items to obtain or update the status of a shipment or delivery, instantly authenticating incoming shipments and reporting damaged or missing items. Picking orders can be made faster and more accurate through the use of wearable devices such as smart glasses. Multiscanning and AR capabilities allow staff to identify correct products with visual scans, leaving hands free for picking and packing orders. The brick-and-mortar retail sector is undergoing a revolution and change is happening quickly. To keep ahead of the game and to create the ‘Store of the Future’, retailers need to look at how mobile data capture solutions based on computer vision and augmented reality can help them. A strategic approach to evaluating and deploying mobile solutions in consumer-facing, in-store or back-of-the-house use cases with a clear outcome in mind – driving customer satisfaction and loyalty or achieving operational efficiencies – is key for retail transformation and success.